It’s the place you create memories with family and friends. You spend hours watching DIY shows on TV, planning how to put your touch on the place you call home. For most, their home is the biggest purchase of their life. Of course you want to make sure the place you rest your head is protected properly. Home insurance will vary some from each insurance company and each state. You don’t want to wait until you’re ready to file a claim to find out you’re not covered. Let’s take a look at the core coverages of a homeowners policy. This is going to be the first coverage listed on the Declarations Page of your policy. The Dwelling refers to your home. Your castle. The structure. Anything and everything fastened down is part of the structure. Cabinets, light fixtures, plumbing, heating and cooling…all part of the structure of your home. Here in the midwest we face a certain amount of risk. Springtime brings storms. Sometimes those storms bring hail. Missourians aren’t immune to tornadoes either. In the event of a total loss, what would it take to replace your home and make you whole again? The number next to Dwelling on your Declarations Page is how much it would take to replace your home in its entirety. Where Did You Come Up With That Number? It’s important to remember, the cost to replace your home is different than the market value. Market value will tell you how much your home is worth if you wanted to sell it. Your insurance agent wants to know how much it will cost to replace your home in the event of a loss. Contrary to what some may think, this number isn’t pulled out of the air. As an insurance agent, we have access to a valuation guide that allows us to determine the cost to replace your home in today’s economic climate. Do you have a detached garage? Maybe a vinyl fence? Typically this is 10% of what you insure your home for. So if you’re home is insured for $200,000, you automatically get $20,000 to cover your detached structures. You can always increase this number if needed. Everything in your home that is not attached or fastened. Furniture, electronics, clothing, dishes (also known as contents). Personal Property will extend to your belongings in your detached buildings too. So your set of Snap-On tools in your shop located behind your home are covered. Usually personal property coverage will be 50-75% of what you insure your home for. So if you insure your home (dwelling) for $200,000, you will have $150,000 for personal property. Where would you live if the unpredictable happened? Contractors inform you it may be 4 to 6 months before repairs are complete. Lucky for you, your home insurance comes with Additional Living Expenses (also known as Loss of Use). If your home becomes unfit to live in due to a loss, Additional Living Expenses will help pay for necessities such as living in a hotel and going out to eat while your home is under repair. It’s a beautiful afternoon. Your kids are outside playing baseball. You’re able to catch up on everything from the week. Your son Johnny rips a line drive over your fence and through your neighbors window shattering an antique vase. Fido notices the kids walking down the street. He takes off after the kids. Biting one of them in the leg. Now you’re facing a lawsuit. It may not be for a million dollars, but accidents happen and emotions run high. Personal liability follows you anywhere. Whether you’re at home or on vacation. Under Personal Liability the insurance company will defend you in the event of a lawsuit and will pay damages to an injured person up to the policy limits. Take time to look over your homeowners insurance policy. Add up how much coverage you are your getting…not the premium you pay, but the coverage you’re receiving. Add up your Dwelling, Detached Structures, and Personal Property limits. That’s a lot of coverage! And we’re not looking at everything. Now look at your annual premium. How many years will it take to pay for those 3 coverages alone? 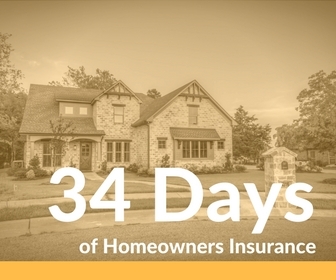 Homeowners insurance provides a ton of coverages and benefits. Take some time to look over your policy every year. There are exclusions and exceptions throughout an insurance policy. Don’t hesitate to ask your insurance agent questions. Want more information like this? Follow us on Facebook or Twitter.